A Malaysia-Indonesia bilateral meeting between Prime Minister Najib Razak and President Joko "Jokowi" Widodo. In a meeting this week between their two military chiefs, Malaysia and Indonesia announced that they had agreed to boost defense cooperation in the area of counterterrorism. The move is just the latest sign of the ongoing effort by the two states to strengthen bilateral, minilateral, and multilateral collaboration as they combat the rising threat of the Islamic State in Southeast Asia. As I have pointed out before in these pages, despite some disagreements on the security side that they continue to manage – ranging from illegal fishing to the outstanding Ambalat dispute, Malaysia and Indonesia do maintain a healthy overall defense relationship. One way in which security ties are managed is through a series of mechanisms between the two sides. Though there have been a range of more general bilateral forums that are convened regularly, both countries also set up a special forum for the management of border issues called the General Border Committee (GBC Malindo) as well as the High Level Committee (HLC) that tends to address security issues more specifically and features meetings between the defense establishments. This week both sides kicked off the 13th round of the HLC Malindo meeting in Kuala Lumpur. The meeting was chaired by the Indonesian military (TNI) chief Gatot Nurmantyo and Malaysian military chief Raja Mohamed Affandi Raja Mohamed Noor. The two discussed a range of issues as is customary during HLC meetings, even though the specifics on issues related to border developments will be explored by military officials separate committees. But the main item that made the headlines was the fact that they had agreed on a range of measures, from the exchange of military trainers to joint military exercises, to combat the shared threat from the Islamic State. “As such, both countries have agreed to undergo joint exercises and acknowledge the importance of combating all those (terrorism) threats,” Gatot told media outlets at a press conference following the meeting. Few specifics were offered as to what exactly they had in mind and how it would fit in with existing lines of effort already in place. But the general focus on terrorism and areas like joint drills comes as no surprise. Generally, in recent years, both sides have tended to use the HLC meeting to either discuss ongoing progress or make new inroads on a range of military mechanisms, from air patrols to intelligence sharing to exercises. More specifically, as I have pointed out repeatedly in these pages, Malaysia and Indonesia, along with the Philippines, have been recently boosting minilateral cooperation amongst them in recognition of the rising terror threat. 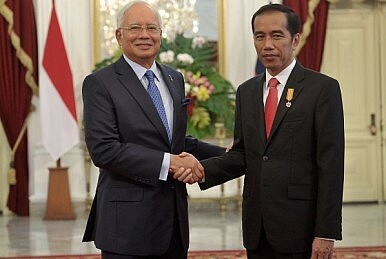 Apart from meeting with his Malaysian counterpart in Kuala Lumpur, Gatot also had a brief meeting with Malaysian Prime Minister Najib Razak, where he received an award recognizing his role in promoting cooperation between the two militaries.